This page contains the personal opinions of the author (Dr. Hain) concerning ENG (electronystagmography) systems. Dr. Hain has been using running vestibular labs and using ENG systems for more than 30 years. He is currently a professor at Northwestern University in Chicago. The present best method to measure eye movements is an infrared/video system -- called VNG or VENG for video nystagmography. Other methods include electrooculography (EOG), and infrared reflectance. Video systems are usually more accurate than the older EOG (electrooculography) method because they are less sensitive to lid artifact and are not affected by electrical noise generated by muscle. Infrared reflectance is little used in recent times because of nonlinearity (basically inaccuracy). EOG testing may still have a place in persons with very small eyes that cannot be tracked with video. For persons who are buying a new system, we strongly recommend getting a video system. A single camera is sufficient for most purposes. Choose goggles that are light-weight, and where the camera can be focused and accurately positioned so that the eye is in the center. These days, Windows software is the standard. Check to see what these systems use. Don't buy systems based on DOS or OS2. The ENG industry is immature. Most contemporary computerized ENG systems grew out of "cottage" industries developed by researchers. Sometimes, a "cottage" company is bought by a large company (i.e. ICS was bought by GN otometrics, the UCLA software was bought by Nicolet, and SMI's clinical system was bought by Interacoustics), but usually this does not seem to result in much improvement in the underlying ENG systems. We suspect that there is just not enough money in selling ENG systems for anyone to invest a lot in improving the equipment. No current ENG system is anywhere near perfect. Most have obvious problems, and nearly all of these companies are very slow to fix glitches in their software. When shopping for a system, keep in mind your main use for the equipment, and find the vendor that does it the best. 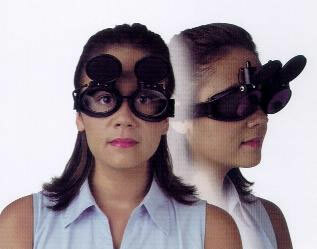 Goggles typical for binocular (both eyes viewing) video-ENG systems. This particular system is made by Micromedical Technology, and also is the system that we use in our clinical laboratory in Chicago. While we occasionally use this system when we are very interested in eye movements, it is much more touchy than the older monocular system (which is our workhorse). Micromedical ENG equipment showing "quad" monitor. The smallness of the monitor and jamming of 4 pictures onto one screen saves space but also discards valuable information about eye movement as the resolution is simply too low. We prefer to send the video to a PIP device, and use most of the screen for the eye, and 1/4 for the lab. This is another video ENG system, a relative newcomer compared to Micromedical technology and ICS (see below). Dr. Hain has not personally used any of the Balanceback equipment. In terms of overall design, the system appears to be a "me too" VNG and platform system quite similar to the MMT and ICS offerings. The company also sells a balance platform which is similar to the device invented by Neurocom. This looks to be competition in action - -it remains to be seen whether or not this company will capture a significant market share. In my assessment of their goggles at a local convention, it appeared to me that they repeated the same goggle blunder made by several others - -they used slow low-resolution cameras without a method of positioning them. We are also unimpressed that binocular recording is needed - -we would rather see more engineering effort going into an innovation(see below). What about some innovation ? We would like to see some significant innovations from new companies (even old companies). Balanceback seems to have cloned the ENG and posture platforms of competitors without adding any significant improvements. We would love to see a system that does real-time torsion. It would also be very handy to have a system that would do "after the fact" eye tracking - -digitization of eye movement video's ? What about a system that provides a fast camera option for opsoclonus tracking ? We are somewhat unexcited about systems that digitize video and provide small blurry windows on the screen. In the author's clinical practice, ENG equipment supplied by Micromedical Technologies, Inc. is used, supplemented by an ICS caloric irrigator. We have also recently acquired an ICS ENG system. With respect to the micromedical system, we have used both the monocular goggles and the binocular goggles. In the older version of the binocular goggles that we tried, the monocular system was better tolerated by patients because of the larger diameter of the contact surface with the patient's face in the monocular version. The binocular goggles also had a problem with the viewing panes fogging up, because they were close to the patient's eye. There is a newer version of the goggles that is more comfortable and has a built in defogger. The manufacturor claims that these improvements have resolved the issues. 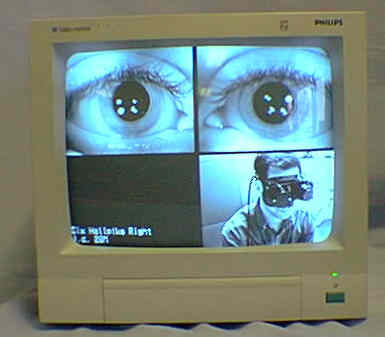 The MMT system optionally captures eye movement video's. The quality is not terrific, as the iris detail is lost, but it suffices for most clinical purposes. An example of a captured video is shown here. Oddly enough, the eye movement video's are captured in a proprietory codec format, but they can be converted to ordinary AVI files using tools on the internet. A more usable method of capturing video (as well as quicker and more generally funtional) might be to simply capture the "quad" video above with a $300 digital video recorder (we favor the panasonic recorder). Here a second room mounted camera and a PIP (picture-in-picture) processor to show what is going on would be essential. We use this type of system for our bedside testing, and we are very happy with it. We find that the Micromedical equipment produces excellent video eye movement recordings, and generally we are satisfied with it (although my audiologist prefers ICS). Customer support is exemplary. If great oculomotor recording combined with 'OK' caloric testing is your main goal, and you can tolerate a lot of manual analysis of the recordings, this is the system for you. Poorly thought out calibration methodology -- this system takes some getting used to and even experienced technicians seem to make very frequent errors. We discuss the unfortunate results of calibration errors in the saccade page. Pursuit calibration error. Note that the eye trace is much greater than the target trace. These types of errors are very easy to make with the MMT software. Saccade calibration error in patient with Bilateral INO . The unfortunate effect of this calibration error was to make the eye movements of a patient with MS look nearly normal. All ENG systems have their problems. We are just very familiar with the one we use. If one is aware of these problems, one can compensate for them, but nevertheless, one might want to consider other systems if one is purchasing new equipment. We also have VENG equipment sold by ICS (recently bought by GN otometrics) and we have a generally good opinion of it. ICS uses a proprietary hardware design. Generally ICS software is excellent, but somewhat inflexible. It is impossible to rename test modules (for example). We particularly like their caloric analysis software, and if this is your main goal, buy an ICS system. Technically they tend to be somewhat behind, but they are putting a lot of effort into their VHIT software. This system is the main alternative to the Micromedical equipment. 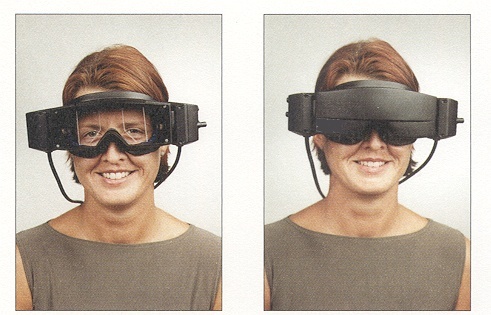 Interacoustics video ENG goggles. Note the large lateral extension of these goggles which interferes with positional testing. We have used equipment sold by Interacoustics, but we prefer the Micromedical system. The Interacoustics system is a rebranded SMI clinical system. The hardware is quite good. The goggles are good for oculomotor testing, but not so good for procedures that involve head positioning or head movement (i.e. positional testing, head-shaking test) because they have such a large lateral extension (see above). When one is lying on ones side, the goggles get in the way. SMI also sells a research system that does torsion. We are not sure about this system -- it seems very flexible and technically advanced but just too expensive for clinical use. We particularly like SMI's ability to provide analog outputs. 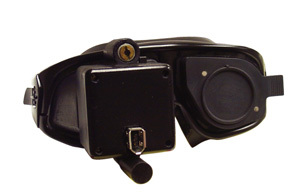 A 2009 product from SMI is a non-contact eye movement monitoring device. This device reminds us of devices we have previously seen developed by the US defense department, to track the eyes of pilots. Our impression of it was that it was "gee whiz" technology - - neat, but not terribly accurate, and not a methodology that would be very likely to be useful for an ENG lab. Seems to us that it could be useful for someone who was studying scan paths of people reading materials. We don't know the price, but from previous experience with SMI's torsional device (see above), it is probably prohibitive for anyone but those with very deep pockets. 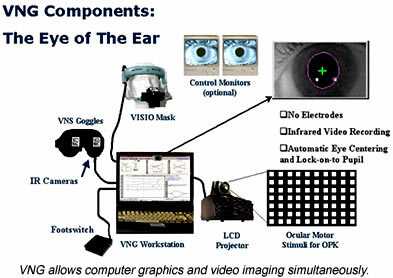 "Video ENG was originally developed and patented by Eye Dynamics, in collaboration with the House Ear Institute. Eye Dynamics enjoys excellent customer satisfaction from over 3500 units in the field. Customer references indicate outstanding past performance and overall customer satisfaction relative to similar companies. Eye Dynamics has become a significant player in VNG devices. It is distributed by InBalance (for Non-ENT or Audiology Sales) in the USA and MD International (for Latin America Sales and the Caribbean)"
Goggles typical for monocular (single eye viewing) video-ENG systems. This particular pair is made by Neurokinetics. Nearly all vendors listed below make very similar devices. This small company, founded by Jan Parmentier, originally sold rotatory chair systems, which they call "Barany chairs". In recent years they have also developed video-ENG equipment. Their VNG goggles appear advanced in some ways (IEEE interface -- a good idea), but rather limited in others (no analog output). In my opinion, the lack of analog output is a fatal flaw. I hope that they correct this problem with a new model, as the IEEE interface is rather nice. Neurokinetics dropped support for their older "Barany chairs". As these devices are extremely expensive -- this is analogous to Mercedes deciding to stop repairing one of their very expensive vehicles. I have not used their VNG equipment, but I have encountered output from their systems many times. They seem to be favored by the VA. A collection of images of their equipment along with some additional comments of mine can be found here. Nicolet bought the ENG software developed at UCLA about 20 years ago. We are not sure if they are still selling ENG equipment -- the Spirit was the product that they offered. We can't even find it on their website. We have had no experience with their equipment. It is very little used and appears also to have been "frozen" in time since it was bought 20 years ago. This system uses the OS/2 operating system ! We have also used equipment from Synopsis (a French company), but ultimately we were dissatisfied with the software. It is an interesting system that attempts to measure torsion from the iris signature, somewhat similarly to the SMI system. The goggle design is small but it lacks an ability to position the eye in the camera frame as well as a focus. In our opinion, these are fatal flaws. 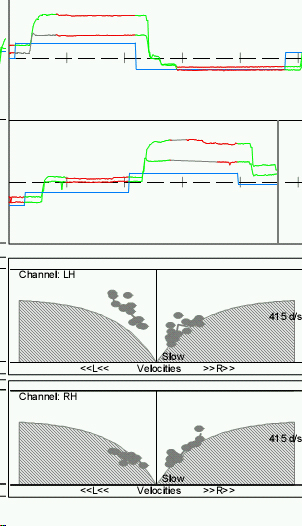 Some IR video systems offer digital recording of eye movement video's (ICS and MMT, perhap others too). We find this somewhat useful (see MMT example above). When there are questions about the analysis, one can go back and look at the eye. Also, it is sometimes nice to have a movie of the test for medicolegal purposes or just a "gee-whiz" thing to send to patients who are interested in the process. This list of things has probably changed -- we would suggest avoiding goggles that don't offer an easy adjustment of focus, or have a method of positioning the camera with respect to the eye. If you run into this in a piece of contemporary equipment, you are probably dealing with a clueless company. Avoid ENG systems sold by very small companies and especially by companies that refuse to support their previous hardware or software. Avoid all video ENG systems that don't focus or position their cameras -- this is a common fatal flaw. The list of ENG companies gets smaller from year to year. Many seem to go out of business. Some (like Neurokinetics) stop supporting their old products. Keep this in mind -- if you are planning to use your equipment for a long period. One should have a 1 or 2 month return option built into any ENG purchasing/leasing agreement. Be prepared to return the equipment.